Do you like ffmpegX and want to support its development? Please register. Click to download and install the latest version of ffmpegX for MacOSX 10.2, 10.3 and 10.4. For support, check the FAQ page and the ffmpegX forum. You may also like to sign up the mailing list. Have a suggestion on how to make ffmpegX even more useful? Send your feedback and comments to major. This guide provides a step-by-step process to create SVCD with two audio tracks for viewing on a SVCD-compatible DVD player. A similar process can be used to encode a CVD or a DVD with two audio tracks. Follow this guide to encode a normal SVCD with one audio track. In the "Tools" tab, keep the "Split" and "Author" options disabled, and the "Keep elementary streams" option enabled. At the end of the encoding process, you will obtain a .m2v file containing the video stream, a .mp2 file containing the audio stream, and a .mpg file containing the movie for computer playback. After checking the .mpg file, you can delete it and keep only the .m2v and .mp2 files and proceed to the next step. If you already prepared your second audio track as a separate audio file, then skip to the next step. If you need to extract a second audio track from a source movie (eg. from an AVI file or a VOB file containing multiple audio tracks), open your source movie in ffmpegX, click the "Quick presets" pulldown menu and choose "movie audio to mp2" (If the source file contains multiple audio tracks, choose the track number in the Audio tab). Click encode. An MP2 file will be created to be used as a second audio track for your SVCD. Select the .m2v file in the first Browse tab. Select the first audio track in the second Browse tab. The file should be in mp2 format. 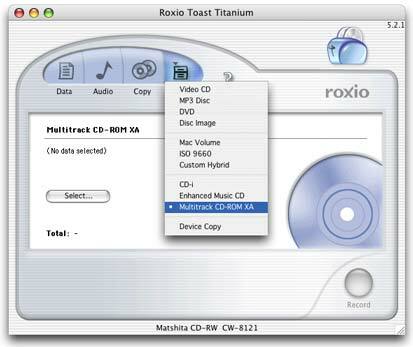 AC3 sound is intended for DVD and cannot be used for SVCD or CVD. If you select a different format, like WAV or MP3, then it will be automatically converted to MP2. Select the second audio track in the third Browse tab. The file should be in mp2 format. AC3 sound is intended for DVD and cannot be used for SVCD or CVD. If you select a different format, like WAV or MP3, then it will be automatically converted to MP2. 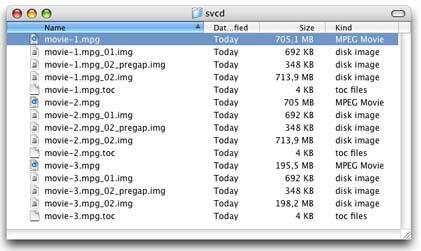 Select "SVCD" in the Mux as.. pulldown menu (or XSVCD if you're creating a SVCD with non-standard bitrate or image size, or if you're creating a CVD). In the "Video" tab, select the media you will use for burning (eg. 74 min mode-2 or 80 min mode-2). Locate the authored files by clicking the icon. For each CD, you will obtain two .img files named "_01.img" and "_02.img" (containing the movie for burning) and a .mpg file (containing the movie for computer playback). The .toc file can be used for burning with cdrdao-based burners, and it can be ignored. If you burn with Toast® 5, select the "Multitrack CD-ROM XA" option in the "Other" tab, drop the two .img files on the window (_01.img first, _02.img second) then burn. Repeat for each disk. 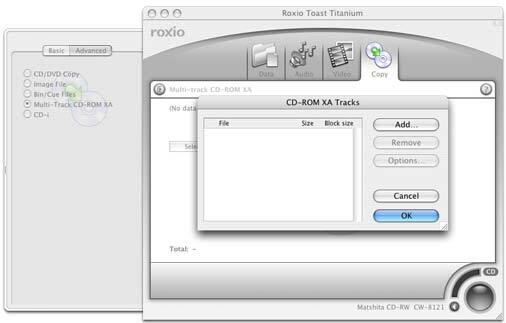 If you burn with Toast® 6, select the "Multi-Track CD-ROM XA" option in the "Copy" tab, click the "Select" button, then drop the two .img files (_01.img first, _02.img second) on the "CD-ROM XA Tracks" window and burn. Repeat for each disk. In case of DVD player playback, click the "Audio" button of your DVD player remote control to switch from one audio track to the other. In case of computer playback, use VLC to play the mpg file and select the "Audio track" menu to switch from one audio track to the other.